It’s one of those strange shortcircuit or happy bi-linguist slips. Deltiology,the official name for the practice of collecting postcards, involuntarily mutates in my mind into deleitology. An old-fashioned word for an old-fashioned hobby. I’ve been hunting down these fetishised views of Caracas for the last few years. Frozen in time, these pockets of nostalgia remind us of a city that I can’t be sure ever really was, but at least wanted to be. 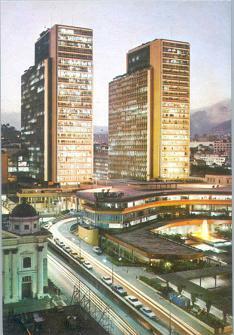 Orderly, hushed and contained – Caracas nestles into the postcard’s habitual frame.